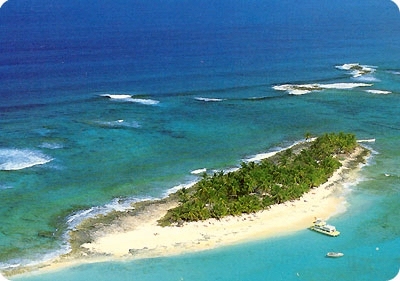 The island you see in the distance during the beginning theme of the FIRST season is an actual island called "Sandy Cay." 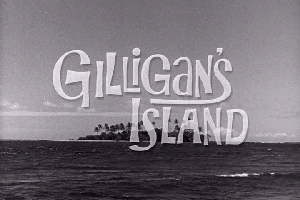 Known as the 'Most Photographed Island in the World,' this gorgeous 3 acre island off Nassau provided the backdrop shot for Gilligan's Island. It's also the scene of a documentary by Huey Lewis and the News, Coppertone commercials, various movies, exotic weddings and much more. Description: Sandy Cay - also known as the Honeymoon Island - is located just three miles northeast of Paradise Island and seven miles from downtown Nassau (a short boat ride). Pristine white-sand beaches fringe a perfect anchorage, palm trees sway in balmy tropical breezes, a long sand bar stretches westward, and to the east - unspoiled sea gardens. With 3 rustic cottages, picnic tables, 10,000 gallon rainwater tank, lavatories and showers, this island makes a great private retreat, but is ideally suited for further development. Nothing complicated, just an idyllic island in the sun. The ruins of a 100-year-old stone cottage - the Guinness Book of World Records called it 'the world's smallest hotel' - add to the ambiance. A beautiful powder white sand beach extends around the protected side of the island. The water ranges from the most gorgeous crystal clear aqua to cobalt blue. Steps lead to the eastern end of the island and the beautiful marine gardens. Sandy Cay faces the Atlantic Ocean on the north. On the south lies Rose Island, a beautiful 11-mile long island with palm trees dotting this tropical paradise. 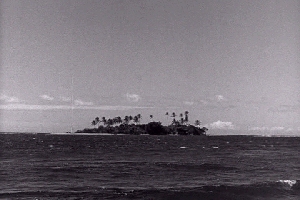 The island was owned by the Moseleys, an old Bahamian family. The story goes that an ancestor bought it from the British government for a single crown in the 1860s. A big plus, Christie said, is Sandy Cay's proximity to Paradise Island, which is packed with tourist amenities and resorts, including the giant Atlantis. 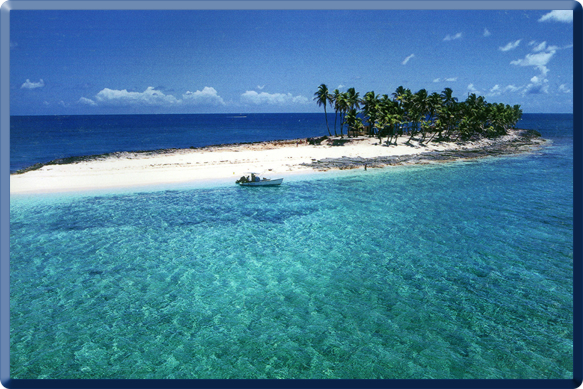 The cay (pronounced key) is fantastic for picnics and charter excursions. There are good snorkeling drops nearby and seasonal fishing. Perfect for a tourist venture, this island had a great rental history. 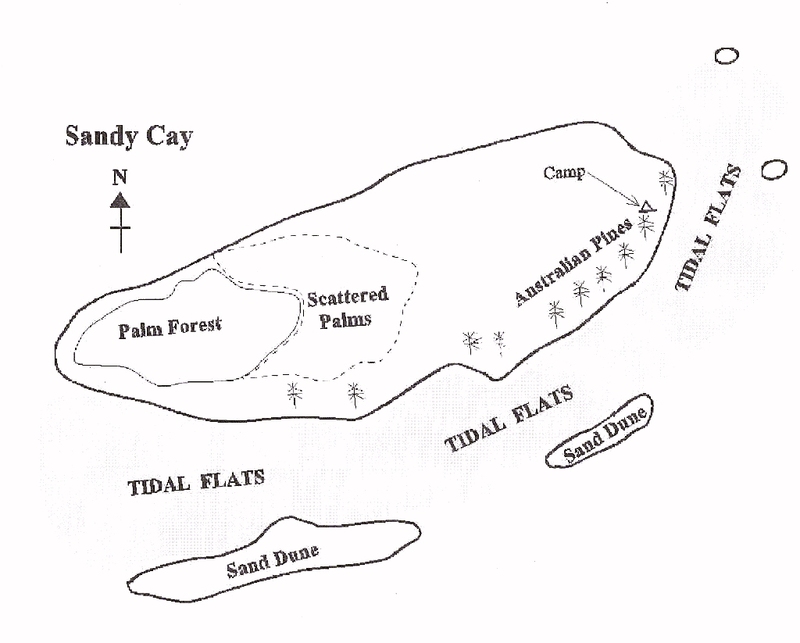 Sandy Cay is nearly cut in two, about amidships. 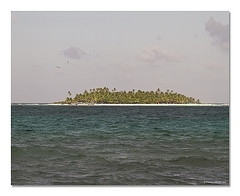 High tide covers the low narrow beach, making two islands. There are some permanent moorings placed along the eastern shore of this beautiful island. These are intended for the typical day rental boat, not your chartered sailboat! If the surge permits, you could anchor outside the reef and dink into the permanent moorings. People have rarely found the surge suitable for this technique! You're best bet is to anchor on the west side of the island, and then depending upon conditions, dink back around to the reef, or walk across the island and swim out to the reef. The anchorage indicated on our chart is intended for a day stop only. The holding ground is poor (rocky), and the surge can be bad even though you're in the lee of the island! If you have an extra crewman, it wouldn't hurt to leave someone on the big boat for anchor watch. Rotate the duty. There will be other great diving opportunities, where conditions aren't quite so adverse. The snorkeling is interesting all along this reef, but it is absolutely sensational north of the little rocky island, about halfway up the east shore of Sandy Cay. If you walk across the island, you'll have to clamber over some coral to get there, but you can minimize this by following a path along the narrow beach between the coral and the dunes. The farther out you snorkel, the more spectacular it becomes. Even when it's breaking, you can enjoy fine snorkeling inside this reef. A famous French undersea explorer has extolled this reef as one of the most beautiful in North America. 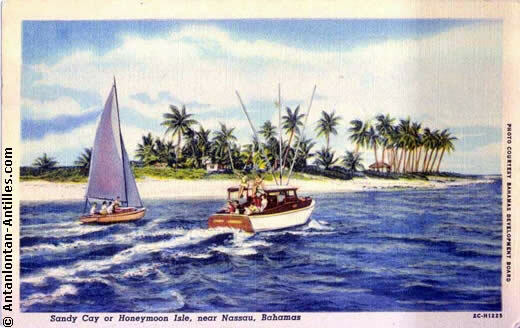 Here's an interesting vintage postcard... from the mid 1950s... shows a view of beautiful tropical Sandy Cay near Paradise Island, Nassau, The Bahamas ... used as the backdrop for the famous TV show "Gilligan's Island." Sandy Cay has been used by countless fashion photography shoots and videos because its natural beauty qualifies it as the nearly-ideal Caribbean island.